TP Baseball uses three ten-sided dice, and will be quickly picked up by the experienced tabletop manager. For those of you new to the experience, the game can be easily understood by just sitting down and playing a few games. Nothing beats the hands-on experience. The dice create a three digit number from 000 to 999. Review the two players cards after the roll. 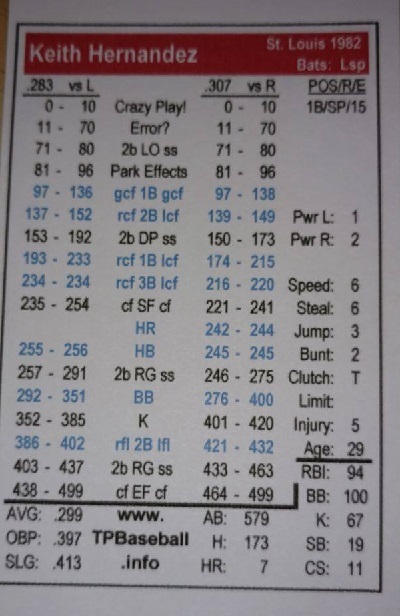 Results of 000-499 are read on the hitter's card and 500-999 are read on the pitcher's card. Most results are explained easily right on the card. A few may need the use of an outside chart, but after playing the game a couple times, most of the results should become second nature. Cards from 1996-2003 were produced under different formats and styles, and may not be representative of the cards today. Season Deluxe Versions come with everything you need to play the game. A complete product (except for The Alternates). Dice, scoresheets, instructions, charts; They're ALL included. Season Card Sets are the set of cards as a stand alone product. There are 900+ cards produced each season (including the 8 pitcher hitting cards and the emergency pitcher's card - ala Jose Canseco back on the mound again!) Comes with an updated PDF copy of the charts to your email address. If this is your first set of TP Baseball cards, you should probably order the Deluxe Version so that you may get the dice, scoresheets and instructions necessary to play the game. The Alternates is a great new set of cards to complete your collection. TP Baseball already has the largest set of cards to come with the regular game (900+) and now we are offering to include EVERY player that appeared in a game last season. Your favorite rookie came up for a cup of coffee and had only a few at bats? No worry, every player with at least 1 AB or .1 IP will be included. More than 300 additional cards! HIGHLY recommended as baseball is changing and more limited AB and IP players are making a difference! 1992 and earlier TPB sets available for you to relive classic baseball seasons from the past. Color Post-Season cards! Get your classic TPB sets in color! Each team features unique team colors, along with highlighted offensive numbers. Color All-Star Cards are now available! Complete rosters for the AL and NL are available printed and cut. Charts for the All-Star sets will be emailed in PDF form. Color printed card sets are available. 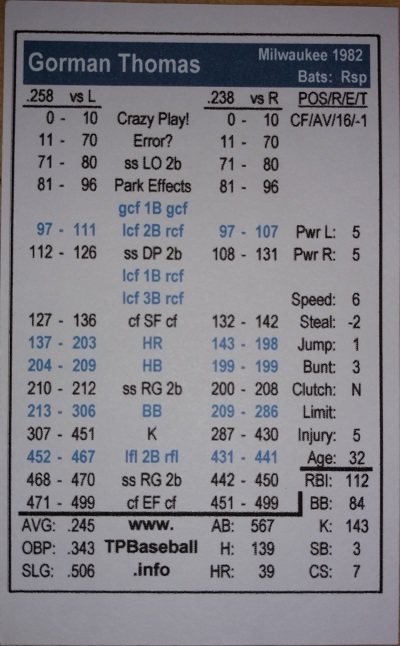 Note that these are cards only, without the printed instructions, charts, or rosters (which are provided by PDF email). All players are represented, no need to buy any sets of The Alternates with Classic TPB. You can get printed charts with the printed sets if you'd like something a little nicer than a PDF file. A display book (plastic binder with clear plastic sleeves inside) containing that year's shaded charts and extra sleeves for your own important TPB papers. Current season guides are available in print only, from CreateSpace.com and Amazon.com. If you need a season not currently listed on the sites, contact us and we'll work on setting it up for you.